The beginning of a garden or driveway starts with an excellent design. The design is of the utmost importance as without this the project will fail, no matter how well constructed. From the biggest estate to the smallest back yard, design is all about scale. Making the most of the natural features or maximising the space available. Tell us what you want from your garden and we will sculpt it into a floral paradise or a modern oasis. Whether you want a boating lake or wildlife pond, a sweeping terrace or a walled garden if you have the space we can make your dreams a reality. 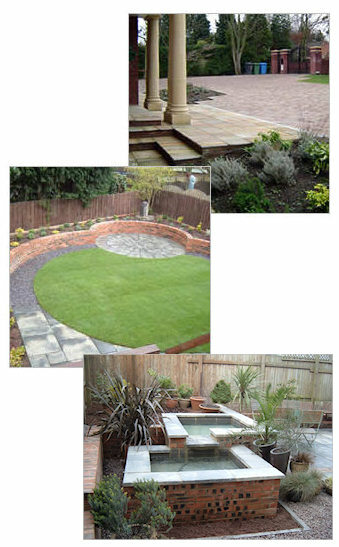 We can transform an uninspiring yard into a horticultural haven or a building plot into a relaxing retreat. Do you realise most houses have more outside space than inside space so why not make the most of it. It could be the one “room” of the house that is not defined, a dining room on summer evenings, the kitchen for a Sunday barbeque, the lounge when you want to get away from it all or the office when you need to work from home, the playroom when the kids are off school, or somewhere just to lose yourself in thought. Whether you are a gardener or a socialite we can give you so much more than a garden. This only comes with experience and knowledge with well proven ideas on how to turn an area into a practical, useable space. Good planning and preparation of the site ensures the project is carried through to completion with minimal disturbance to you and your neighbours, leaving you with a sound investment which can be enjoyed by all.